There are no other areas of entertainment media distribution that has shown as much exponential and sustained growth as online subscription services over the last ten years – especially in regards to Streamed Video on Demand (SVoD). With the rise of cord-cutting as audiences increasingly move away from traditional TV subscriptions, such as cable, to engage in online subscription services instead, the SVoD market has seen vast investment to capitalise on a trend that shows no signs of slowing down. However, as with any market that shows seemingly unlimited growth, competition is intensifying and consumers are becoming increasingly nimble and savvy when choosing how to spend their time and money on a particular service. In 2019, we could see a potential watershed moment in SVoD when Disney enter the fray with their own SVoD platforms to rival the likes of Netflix, Amazon Prime, and Hulu. In a marketplace that is becoming increasingly diluted with services and an expensive arms race has begun with original content aiming to win over and – more importantly - keep subscribers, could we be approaching a scenario where certain subscription models could become unsustainable in the face of ever-multiplying competition? 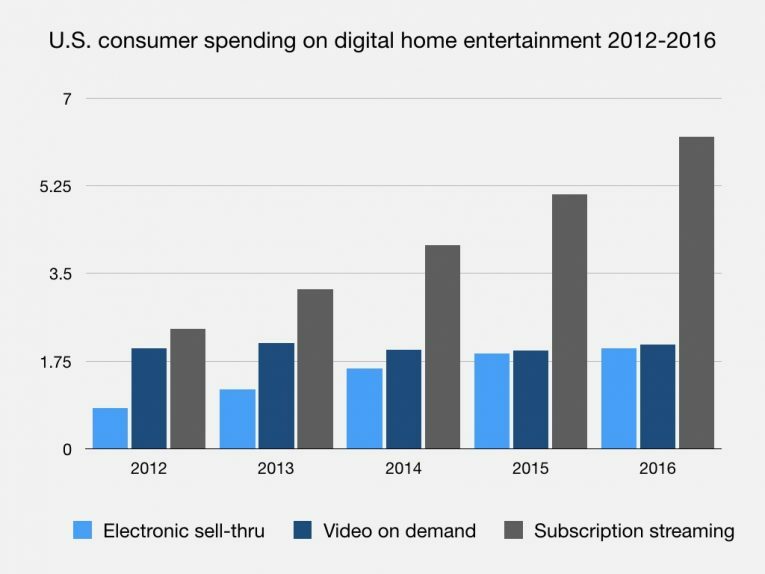 When we look at the sheer expansion in spending on subscription services over the last four years alone (according to the below survey from Digital Entertainment Group), it is easy to see why SVoD has become something of a golden goose in home entertainment. The two deciding factors of “Content” and “Price” can be interpreted as users seeking value from a subscription service based on the quantity of content available through it. If this the case, then the current “me too” attitude of TV and film studios – such as Disney - launching their own subscription services will inevitably lead to SVoD giants like Netflix and Prime losing premium third-party content as those studios will retain their own product to support their own online platforms. 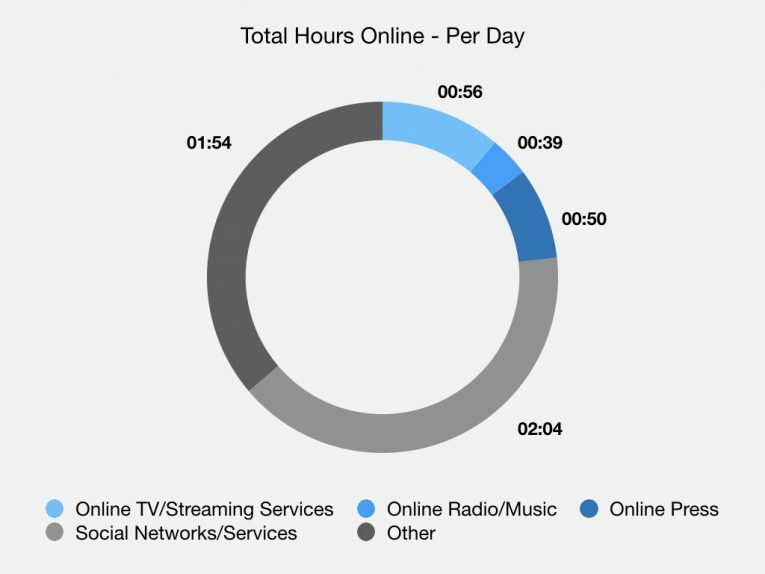 This limited time spent on streaming video means that perceived quality of content could be just as important as variety to the average user and it is likely that both factors combined are ultimately the deciding factor in choosing a particular service. And for such a relatively short time window – which essentially translates into a single episode of a typical US drama - to engage viewers, SVoD services will need to provide both quantity and quality of content to ensure commitment from their users in the long term. With the proliferation of SVoD services over the last few years and an inevitable increase in the near future, providing both will prove increasingly challenging for the giants of the medium. 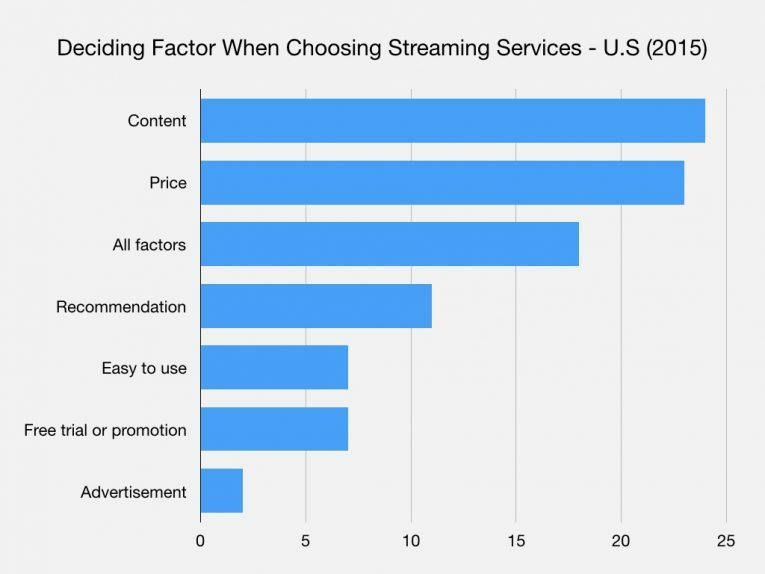 A rising phenomenon amongst online users for SVoD services that will become progressively more frustrating for providers is that of the “streaming switcher”. According to data identified by MIDiA Research using their superb new Fuse platform, 7% of the 28% of US consumers who subscribe to SVoD services “often subscribe and unsubscribe to video streaming services to watch specific shows”. And there is one demographic where this trend is particularly pronounced that should cause Netflix and Prime much concern with the approach of Disney’s SVoD platform. 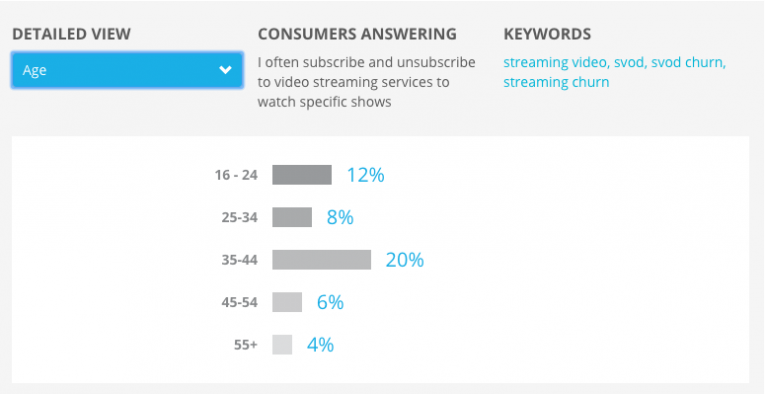 The “35 – 44” age demographic is already a key battleground for subscription services (it constitutes 19% of Netflix’s audience according to Global Web Index) as they are the age range with the highest disposable income in the US, but they are clearly applying increasing scrutiny on which SVoD service they are spending that income on. This is likely caused by more limited time available for leisure for the demographic with the second lowest amount of time spent watching TV among the various age groups. This demographic is also most likely to have children in the home, which will provide a significant advantage to a premium family brand like Disney in countering their streaming switching as parents within the age group seek to provide regular and suitable entertainment content for their kids. This will mean the likes of Netflix, Prime, Hulu, etc could be left fighting for the adults’ limited viewing time with potentially dwindling “primetime” third-party content portfolios as more SVoD services join the marketplace – especially as it rumoured that Disney will pull their content from other subscription services when their platforms arrive in 2019. With the rise of streaming switchers and a progressively crowded marketplace, original content for SVoD platforms will undoubtedly become their most prominent weapons in converting and retaining subscribers. But such content comes at significant costs to the platform providers. According to MIDiA Research, Netflix’s and Amazon Prime’s production budgets have increased 290% and 450% respectively over the last three years and now constitute huge portions of these streaming giant’s budgets (37% of Netflix’s and 50% of Prime’s overall budgets are now dedicated to commissioning original content). These original shows are clearly being seen as longterm investments for these SVoD services but, with Netflix alone currently saddled with some $20 billion in debt, the emergence of fickle subscribers are not exactly a welcome development when the platform’s production outlay estimated to be around $6 billion for 2017. A further sign of how competitive the SVoD has become is that Disney’s announcement of their own streaming platforms was actually met with skepticism on Wall Street as their share price fell by 5% in August this year following the news. The fear would appear to be that subscribers attention and spending could soon be stretched to breaking point by more and more services competing for their time and money. Indeed, if the subscription market becomes over-populated with content increasingly segregated among them, it is a distinct possibility that potentially more encompassing cable packages could ultimately provide greater amounts of convenience and value to higher income consumers. This applies particularly to the aforementioned “35 – 44” age demographic’s subscription habits and spending power as they may eventually decide that the process of persistently switching services is becoming more trouble than it is worth to access the widest amount of content. 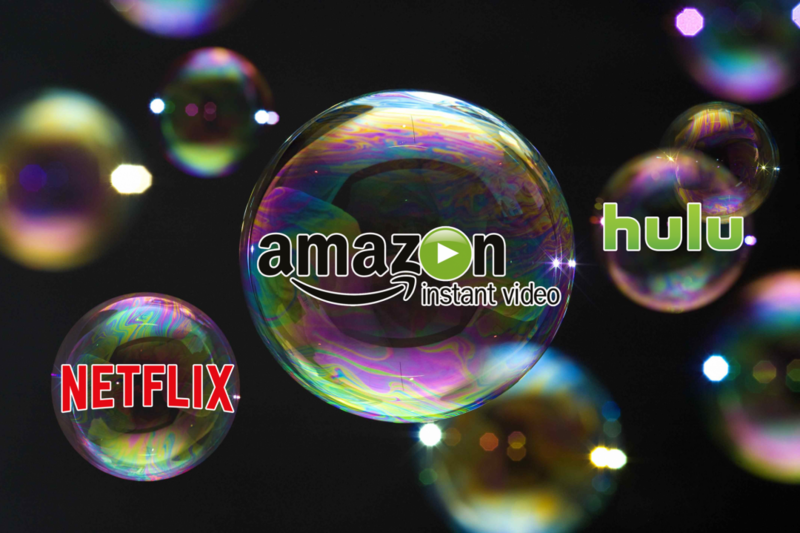 In the near future, further growth in the SVoD bubble is inevitable. But if audiences’ attention and spending becomes stretched beyond the investment needed to sustain that growth, then the subscription bubble’s skin could begin to look very thin indeed.